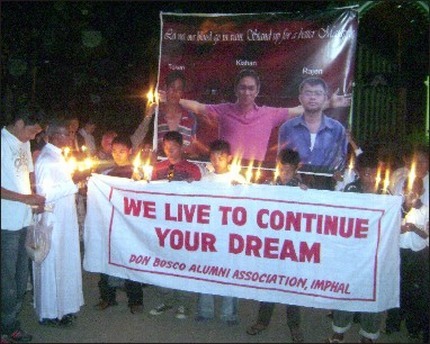 Imphal, April 05 2009: In remembrance of murdered kasom Khullen SDO Dr Th Kishan Singh a Don Bosco, Imphal alumnus, past students of the premier educational institution today observed Global Candle Light Vigil as a mark of love, affection and solidarity. here in the State colleagues of the slain SDO and past pupils of Don Bosco lighted candles at Gandhi Ghat, Uripok the site of cremation of Dr Kishan's body, at 7.30 pm where the participants also observed silence in remembrance of the departed soul. Prior to the candle light vigil a brief prayer session was held at the western gate of Kangla Fort followed by a silent rally till Gandhi Ghat with the message 'we live to continue your dream'. The observance was held under the aegis of Don Bosco Alumni Association, Imphal and among others joined participated by Principal of Don Bosco (Imphal, Langjing & Phayeng) Fr PX Francis, association president Yambem Laba, current students of these institutions and Dr Kishan's family members. speaking at the occasion, Fr Francis described Dr Kishan's untimely demise as supreme sacrifice for peace and prosperity of Manipur with Yambem Laba praying for goodwill of those rebels who had taken up arms in the name of the almighty. According to information received here, the observance was also organised by past students of Don Bosco settled/working/pursuing higher studies in European countries, South America, Asia, Africa, South /North America and in Indian cities/towns such as Bangalore, Chennai, Kolkata, Mumbai, Delhi, Itanagar, Dimapur etc. Students of Don Bosco schools in West Bengal, Bihar, Maharashtra, Sikkim, Andhra Pradesh, Karnataka etc also joined in the observance of the Global Candle Light Vigil. Poster campaign launched : In pursuit of befitting punishment to the culprits involved in the brutal murder of Kasom Khullen SDO Dr Th Kishan, A Rajen and Y Token, a worldwide poster campaign has been launched at THAU ground here today. The main portion of the poster shows the battered heads of Dr Kishan, Y Token and A Rajen. The posters are emblazoned with the words "Most Wanted Terrosists, the Brutal Killers NSCN (IM)". The poster campaign was launched by the JAC constituted against the gruesome killing of Dr Kishan, A Rajen and Y Token. Talking to media persons on the poster campaign, JAC convenor Subhangkar decried that both the State and Central Governments did not dare to speak a single word to NSCN (IM) even though it has been admitted that the murderers were NSCN (IM) cadres. The abject failure of the State Government as well as the Central Government to affect hand over of the culprits so that they can be punished according to law has anguished the people greatly, he said. The poster campaign will be carried out worldwide in pursuit of befitting punishment to the murderers while also condemning such irresponsible nature of the State Government and the Government of India, he added.